The new Globe 13" ONYX Boots are available in both men's and women's sizes, featuring the perfect blend of cushion and contour designed to accommodate your every move. The boots feature innovative Crosstech Footwear Fabric, making them an unmatched combination of strength and protection. They offer specially softened tumbled leather in high-flex areas, enabling them to adhere to any and all movements. The full-height bootie liner is comprised of excellent insulation, which includes the Crosstech moisture barrier that will prevent water damage at all costs. You'll never have to fear slips and falls, as the Heelport Internal Fit System firmly secures the heel in place while simultaneously cushioning the ankle. The Vibram Contoured Cup Outsole joins seamlessly with the leather upper to give you that feel and support of an athletic shoe you love. Getting these boots on and off will be no problem, as the Nominex Webbing Pull-Straps are flexible and strong, conveniently sliding under turnout pants and tucking away easily. If you need protection all around, on all terrain, on the scene and off, the new Globe ONYX 13" Boots will serve you well. They're a must-have for anyone who needs reinforced arch support, or just likes an athletic fit to boots that will last a long, long time. If flexibility is your goal, the Globe 13" ONYX Boots are the right choice for you. 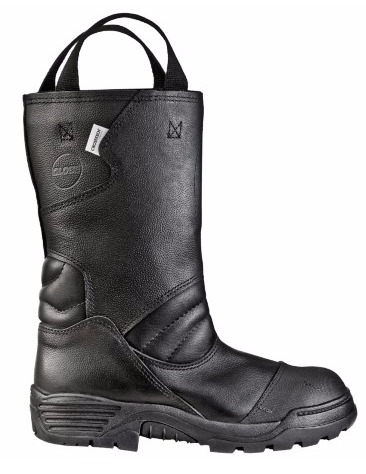 For more information on these innovative, comfortable boots, visit our website.